Lewisia leeana (Porter) B.L. Rob. Leaf: many, dense-rosetted, 1.5--6 cm, +- linear, +- cylindric, entire, +- fleshy, tapered to narrow base, tip blunt. Inflorescence: stems 1--several, 8--24 cm, each with open, rounded, many-flowered, panicle-like cyme; flowers well exserted from leaves; bracts among flowers and below, lanceolate, entire or increasingly gland-toothed distally; pedicel 3--15 mm. Flower: sepals 2, +- 1/3 × corolla, ovate or +- round, +- gland-toothed; petals 6--8, 5--6.5 mm, obovate, white, pink, purple, or magenta, tip generally rounded; stamens 4--8; stigmas 2. Fruit: 4--5 mm. Seed: 1--2, 2--2.5 mm. Chromosomes: n=14. Ecology: Granite, serpentine cliffs, rocky slopes, conifer forest; Elevation: 1300--3350 m. Bioregional Distribution: KR, NCoRH, CaR, c&s SNH; Distribution Outside California: southwestern Oregon. Flowering Time: Jun--Aug Note: Lewisia leeana hybridizes with Lewisia cotyledon (see Lewisia ×whiteae). Synonyms: Calandrinia leeana Porter; Lewisia eastwoodiana Purdy; Oreobroma leeanum (Porter) Howell; Lewisia leana, orth. var. 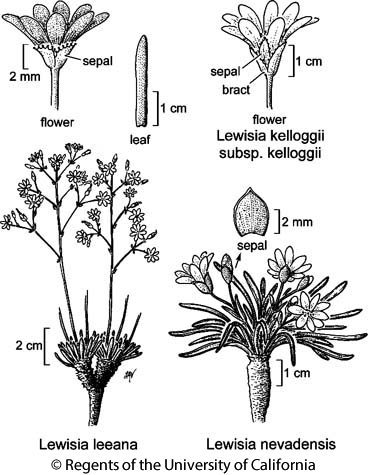 Citation for this treatment: John M. Miller & Lauramay T. Dempster 2012, Lewisia leeana, in Jepson Flora Project (eds.) Jepson eFlora, http://ucjeps.berkeley.edu/eflora/eflora_display.php?tid=30833, accessed on April 22, 2019. KR, NCoRH, CaR, c&s SNH; Markers link to CCH specimen records. Yellow markers indicate records that may provide evidence for eFlora range revision or may have georeferencing or identification issues. Purple markers indicate specimens collected from a garden, greenhouse, or other non-wild location.